Nissan Motor Co., Japan's third-biggest car maker, said it will recall about 540,000 vehicles worldwide due to potential defects in brake pedal pins and fuel-gauge components, mostly in the United States. Nissan said five models from 2008 to 2010 model years, including the Titan truck and Armada SUV, would be recalled due to the risk of the brake pedal pins partially disengaging, causing a loss of normal braking ability. This recall will involve 179,000 cars in the U.S. and 25,800 in other regions, Nissan said in a statement, adding that there have been three reported cases of this braking problem, Reuters informs. Toyota (TM) recalled nearly 8.5 vehicles worldwide for a variety of problems including brakes and accelerators. 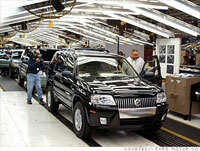 Then GM recalled 1.3 million cars sold in North America that have steering problems. There have also been several other small recalls by other car companies since the beginning of the year and Ford (F) had a non-recall recall of Fusion and Mercury hybrids to "update" brake software. February figures for domestic car sales were announced on February 2 and some companies, especially Ford (F), made impressive gains over the same month last year. But the total vehicles sales figures for car buying activity remains very low. On an annualized basis using the February figures, there will only be 10.4 million cars sold in America this year. That's well below the target of 12 million vehicles set by the large car manufacturers at the beginning of the year, DailyFinance reports. The recalls also affect Canada, Mexico, the Middle East, Ukraine, Russia and Taiwan, Nissan North America said in a statement. The models with faulty brake pedals are the Titan pickup trucks, the Armada and Infiniti QX56 SUVs and Quest minivans built between 2008 and 2010, the company said, adding that it would pull 178,916 units from US roads, AFP reports.